Is there anything better than even skin with no spots, discoloration and other imperfections that make us so unique? Beauty lies in the eyes of the beholder and for many people, including myself, tiny imperfections make the person special and memorable. For example, glowing with health skin densely covered in coquettish freckles looks incredibly attractive and desirable. Therefore, there is nothing more beautiful than these little patches of pigmentation on someone's skin. As you might have guessed, I continue dissecting my favorite makeup trends and today we are going to discuss one of the cutest trends in beauty industry, that made a major comeback - faux freckles! Natural freckles are small clusters of cells, which concentrate an amount of natural pigment melanin. Continuous sun exposure increases the production of pigment and that is how freckles appear on the skin. Of course, freckles can form on all skin types and complexions, but usually they are more prominent on fair rather than darker skin. As with any other makeup trend, it is hard to say who started faux freckles mania first. Some people claim, that this new wave has risen by Meghan Markle an American actress and Duchess of Sussex and musician Demi Lovato. Both ladies love wearing no makeup makeup looks and show off their beautiful skin complexion, covered in natural stars. 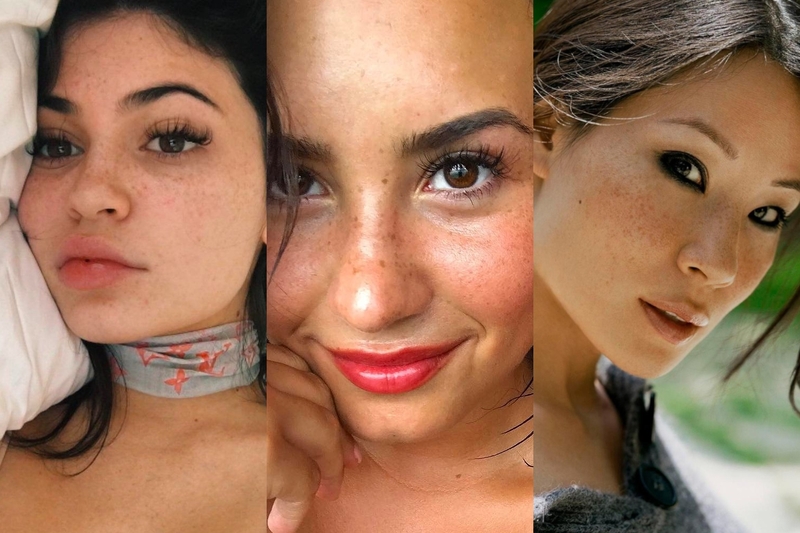 Actress Lucy Liu and celebrity Kylie Jenner have freckled faces and proudly show them on Instagram, so we can assume these ladies also caused the faux freckle trend to grow bigger. While researching the roots of faux freckles trend, I stumbled upon an amazing blog post at Makeup Museum blog, which told us a brief history of faux freckles and natural freckles in beauty industry. 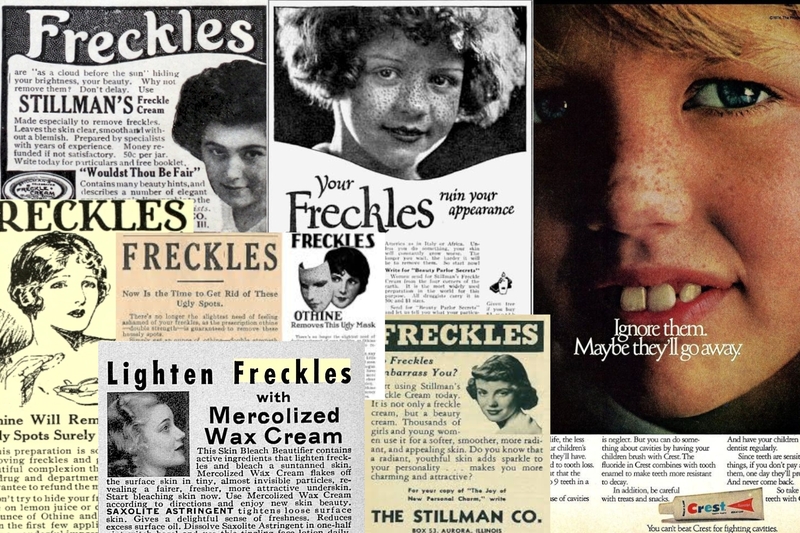 Clearly, through the late 19th century and the first half of the 20th century, natural freckles, skin tan and other skin imperfections were seen as something unattractive and even repulsive. Therefore, whitening skin creams were widely promoted as a treatment against "ugly mask". In the middle of the 20th century, through the late 90s and early 00s freckles have become something natural and more acceptable. Now freckles are something most makeup junkies are crave to have, meticulously sprinkling their faces with countless freckles. There are few ways on how to get those pretty specks all over your skin. You can try using natural herbal colorants like henna. Naomi Jon and Jenna Marbles already tried this semi-permanent method and I'm not sure they truly liked the final results. Another, less dramatic and non-permanent way is using our old makeup buddies: eyeshadow, eye pencil and a fine eyeliner brush or eyelash wand. Grease paint also works great for faux freckles, especially if you have dry skin type. Prime your face and apply your favorite foundation, but do not set it with a powder just yet. Prepare few matte brown eyeshadow colors - light and dark brown, taupe and beige - the more diverse are colors the more natural-looking will be your faux freckles. But remember to use neutral shades, which are close to your natural skin pigmentation. The shades of your birthmarks and hair undertone will help you with the choice. Start applying tiny dots of different sizes, softly pressing the fine eyeliner brush with a pigment on your skin. The stronger you press the brush, the more pigmented will be your freckle. And, of course, freckles emerge on different parts of the face like nose, chin, forehead, neck and even lips, so don't be afraid to place your brush whatever you feel like. You can also use an eyelash wand instead of fine eyeliner brush. 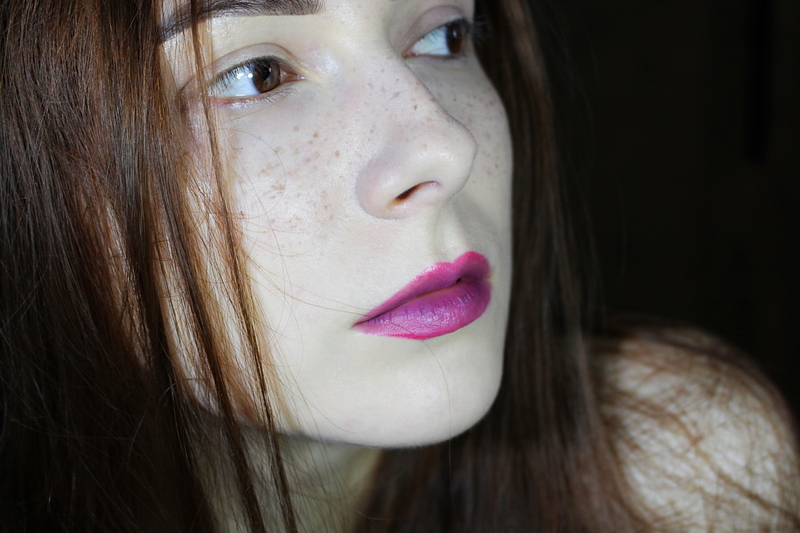 Dip the eyelash wand in the grease paint and press it against your skin to draw a bunch of freckles at time. After you are done with the way your faux freckles look on the skin, set them with your favorite setting or translucent powder. Powder will set the foundation, blot the excessive oil and make your freckles look even more natural. I also like using a makeup setting spray, especially at summer, to prevent foundation from melting. Whilst one people hate their natural freckles and use full-coverage foundation on a daily basis, others are ready to permanently change the way their skin looks. And no, I'm not talking about henna freckles. Tattooing or "freckling" fake freckles on your skin is a permanent procedure that will allow you to wear this trend forever and over time become one with your new ink freckles. There are a bunch of tattoo artists who are ready to give you a set of natural-looking bushy eyebrows and cover your face with frisky dots, sweetly called "angel kisses". 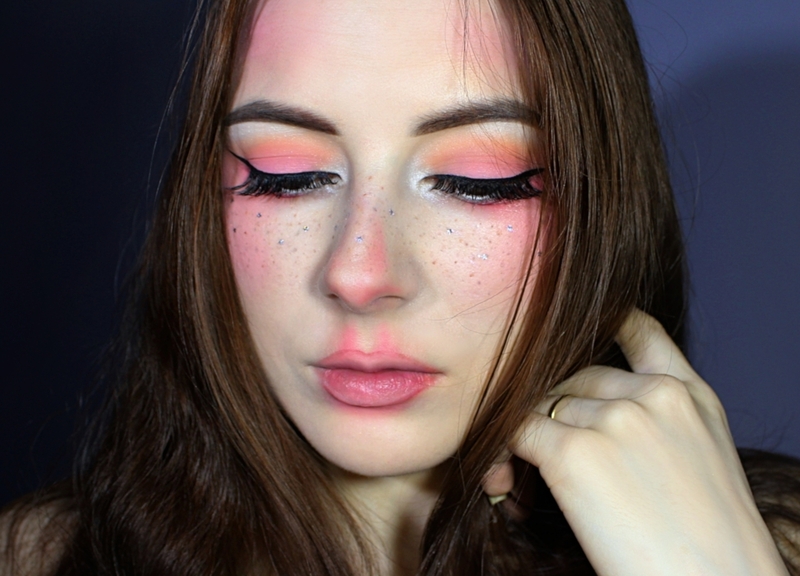 As much as I love natural-looking faux freckles, I just love fantasy makeup looks with colorful freckled skin! I can spend hours and hours, scrolling through the Instagram tags and Pinterest boards, admiring the freckle constellations on faces. 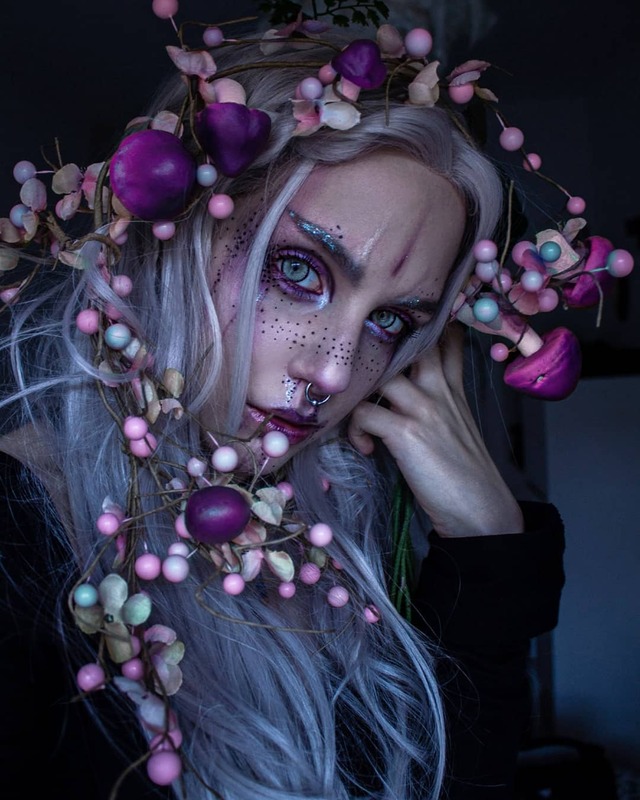 One of my favorite artists, who creates the most magical makeup looks with freckles is Manic Moth and she always inspires me to try new, fairylicious makeup looks. How do you think, will the rainbow freckle trend be big one day? American cinematographer Rachel Morrison claims to love faces with freckles and wrinkles, she says that beauty is in naturalism. Khloe Kardashian, on the other hand, hates her freckles skin and moles, she always wanted to have clear skin. And what about you, lovelies? Do you think natural skin is beautiful with all its small imperfections, fine lines and pigmentation? I used to hate my subtle freckles, especially during the summertime, when they looked more pigmented. Do you have freckles on your skin and do you love them or hate them?